I will admit, I am a sucker for some of the blockbuster authors. Baldacci, Grisham, Clancy, Patterson–I have read and will continue to read their books. An author who can tell a story, make me like a character, and pull me into a place will get my attention. 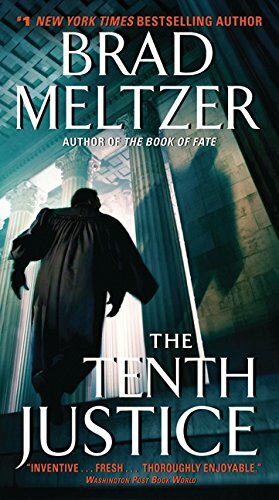 Brad Meltzer’s debut novel, The Tenth Justice, was published in 1997. Supreme Court clerk Ben Addison knows he cannot reveal deliberations or decisions outside the court. When a friendly former clerk just wants to casually reminisce and talk shop, though, what could it hurt? As it turns out, plenty. Meltzer’s book introduces sharp characters, has an intriguing plot with several twists, and pulls the reader inside the Supreme Court and into the life of one of its clerks–a life that is unraveling before our eyes. Meltzer is at his best when painting the portraits of Ben’s closest friends. Although from Boston, Ben’s roommates have been besties with him since high school. Nathan, Ober, and Eric each found their own way to Washington, DC, but they also found their way together. Sharing a house, the friends are each deeply affected by Ben’s troubles. The consequences of their actions together and separately test the limits of friendship and make for some of the funniest and some of the most painful scenes in the book. Meltzer has written several books since this auspicious debut. I may be late to the party, but I definitely plan to add his later works to my TBR list. It may not carry the weight of the Supreme Court, but that would be a good decision for you as well.